Help support the site by purchasing genuine PB gear! All products are American made and union printed. 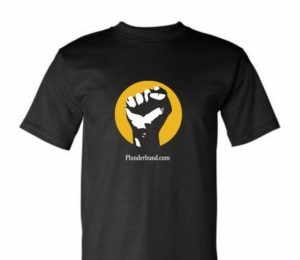 Don’t want any gear but still want to support the site? You can also send us money! These are our 4″ removable bumper sticker. Perfect for bumpers or even laptops, walls, the fridge, or any flat surface really. Our new batch of shirts has just arrived, and it is the first and only one available in black. We have them available in S, M, L and XL. We have also have our older green shirt designs available in S, M, 2XL and 3XL. All shirts are $25 and include shipping! PB Classic – This is the original large fist logo shirt with “All Politics. All Ohio” on the back along with our Facebook and Twitter addresses. The shirt is American made, Union made, 100% cotton. PB Minimalist – This is a new design that uses our bumper sticker design as a front and has a blank back. The shirt is also a lighter weight material than the PB Classic shirt. The shirt is American made, Union made, 50% cotton/50% polyester. PB Ladies – This is a new design by popular request and features a lighter shade of green (don’t worry it’s not neon – we’ll have a better graphic soon) and also a lighter weight as well as a ladies cut. The back is blank. PB Hipster – This is a new design and features a “PBR” Plunderbund logo design on the front. The back is blank. The shirt is American made, Union made, 50% cotton/50% polyester.